Ryan: Oh, My gosh! Thank you, very much. 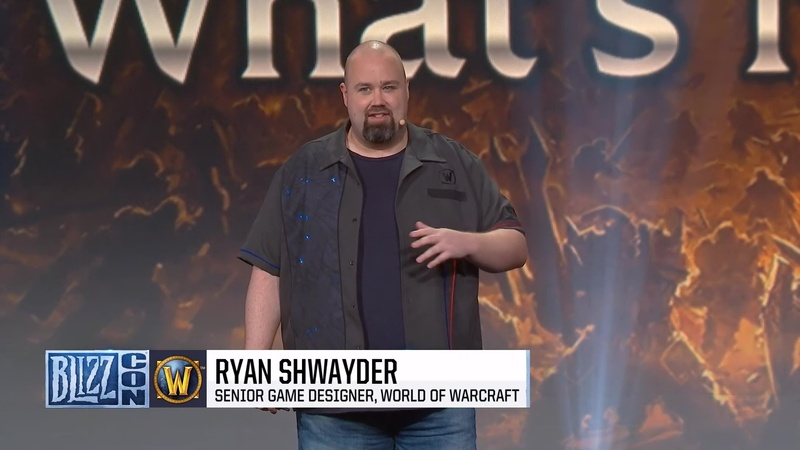 Welcome to BlizzCon and thank you, Ion. Tides of Vengeance is looking absolutely epic; but as a Pandaren once said: “Slow down.” That’s what the “.5” updates are all about. In Patch 7.3.5, we introduced you to the first four Allied races: Void Elves, Lightforged Draenei, Highmountain Tauren and Nightborne. 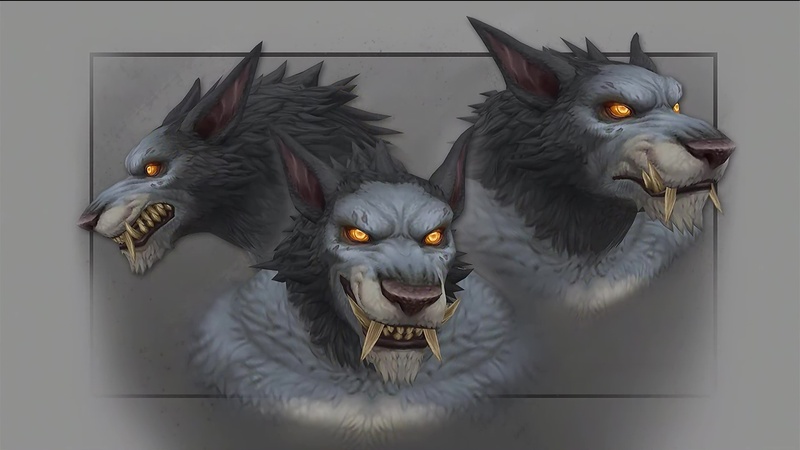 With the launch of Battle for Azeroth, we introduced the Mag’har Orcs and Dark Iron dwarfs; and I’m happy to say that in Patch 8.1.5, we have two more for you. 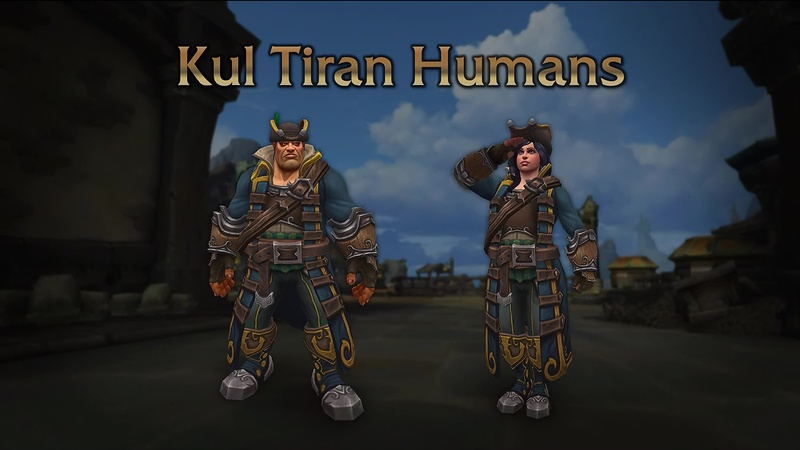 For the Alliance: The Kul Tiran Humans. (Audience cheers) And for the Horde (Audience cheers stronger)… I think the Horde won that one. 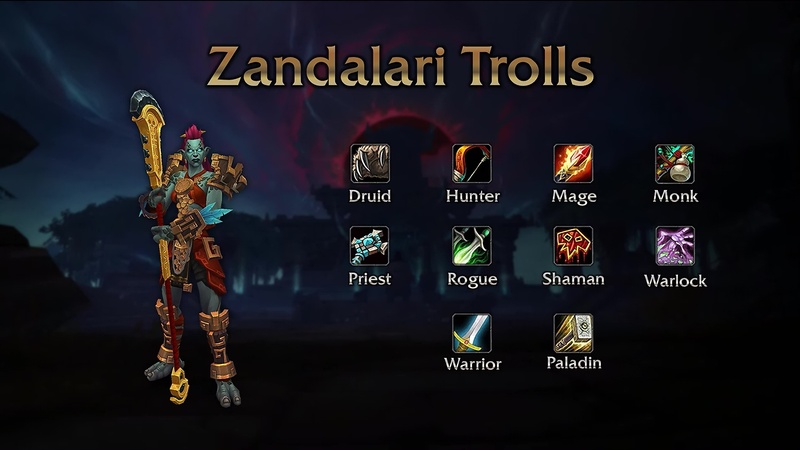 So let’s talk about the Zandalari first. 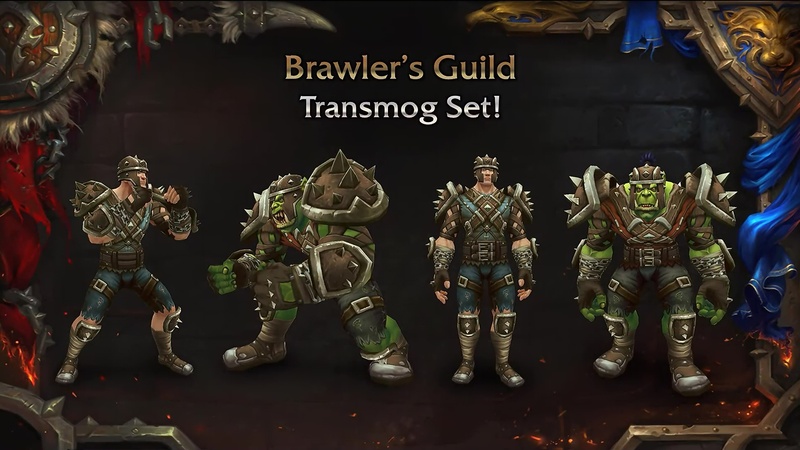 You can see that their Heritage Armor is predictably ostentatious. 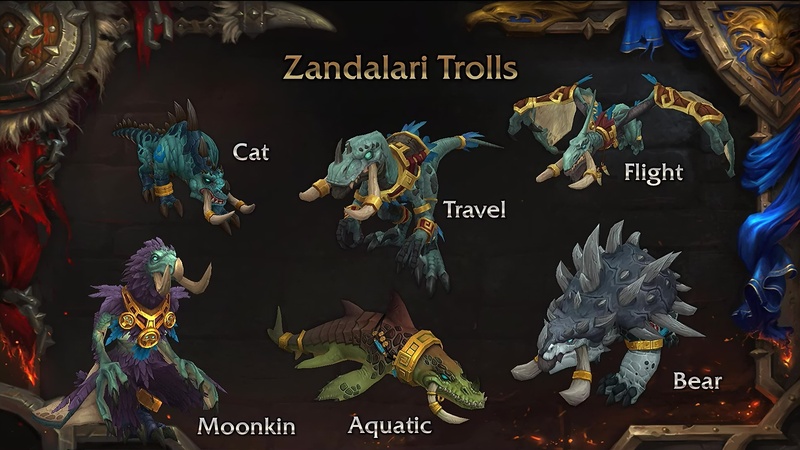 That’s a Zandalari. That’s who they are. Recent unrest within the King’s Council, as well as attacks within their borders have left them destabilized. 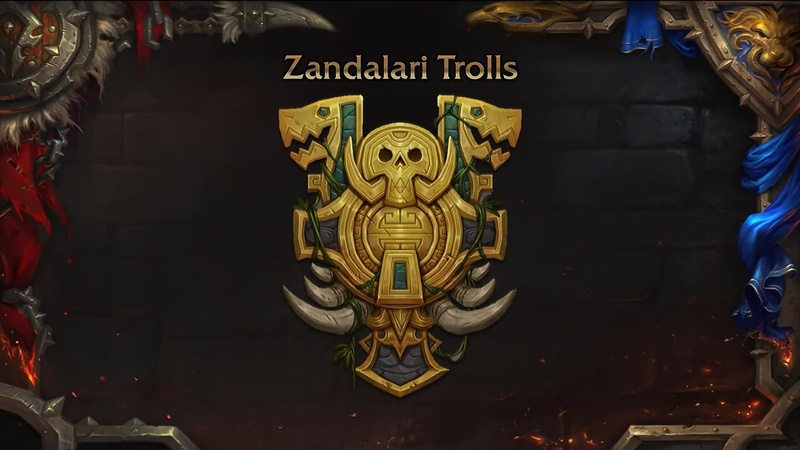 But in helping to stabilize Zandalar, you have earned the Zandalari trolls as an ally for the Horde. We can see from the classes available to them that they’re incredibly versatile people. Perhaps most notably… PALADINS of the HORDE!!! Do you like that? 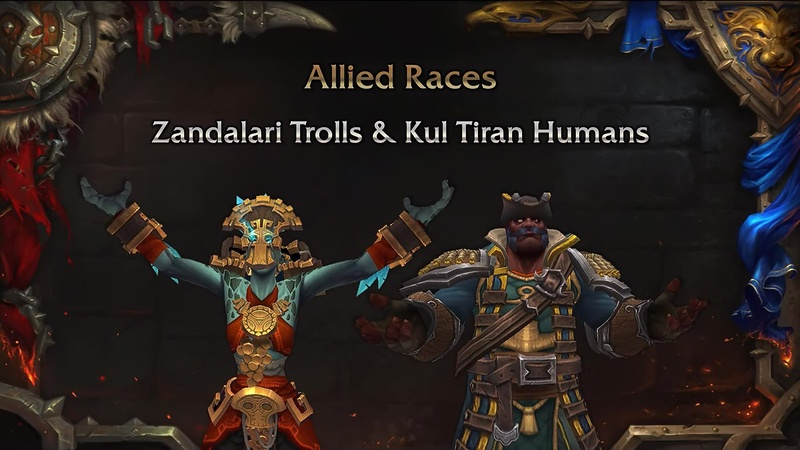 We can see from the Racial Abilities available to them that the Zandalari are lovers. They are lovers of the Loa, with embrace for the Loa. Lovers of gold: the City of Gold. Lovers of not dying, with regeneratin’; and of course, perhaps above all: lovers of dinosaurs, with Pterrodax Swoop. 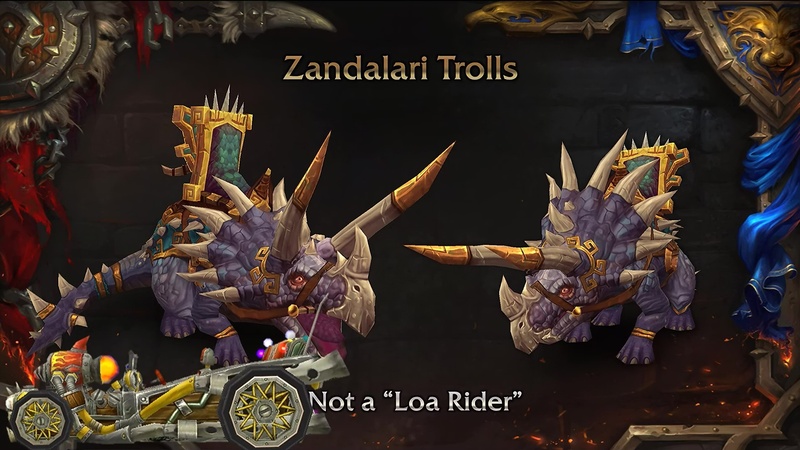 Their mount can be nothing other than a dinosaur. Now, believe me, I tried to convince everyone to make it a “Loa Rider,” but no one’s having any of it. I tried hard. Trust me. 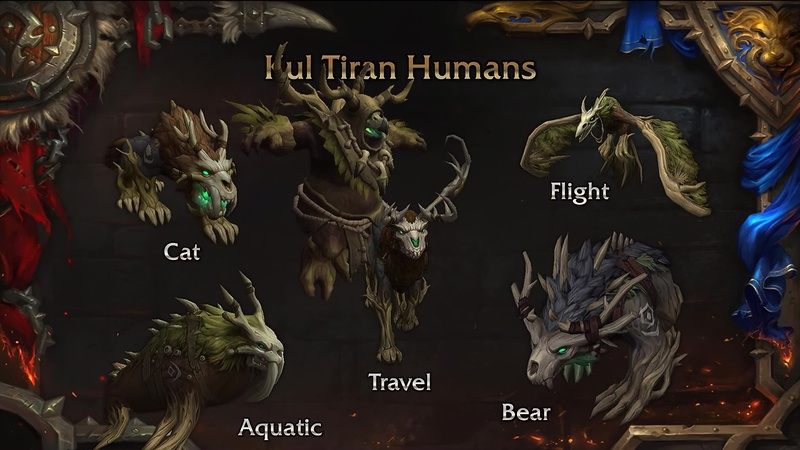 Here’s their druid form. You can see they’re heavily inspired by pre-historic beasts and dinosaurs. Looking really cool. 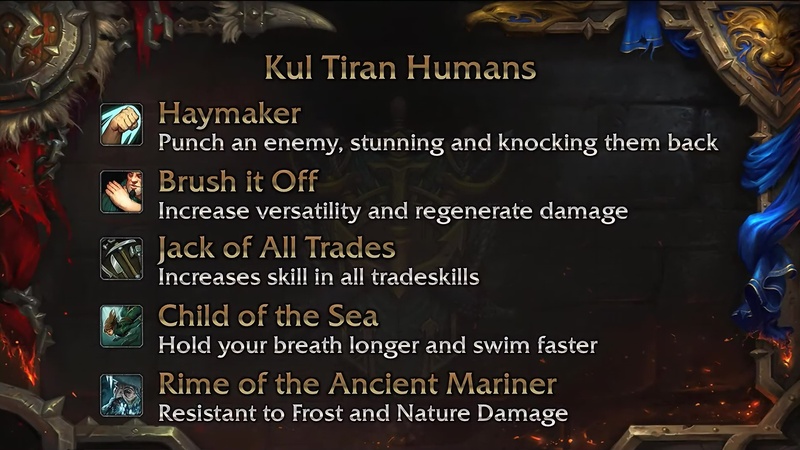 Let’s talk about the Kul Tiran Humans. Yeah! I knew we’d have to get you in, sometime. 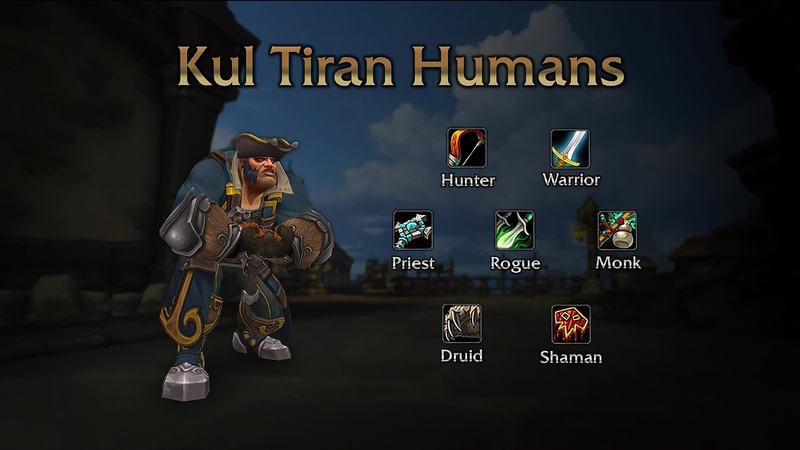 So the Kul Tiran Humans are one of the most interesting new human culture’s we’ve introduced since World of Warcraft launch. 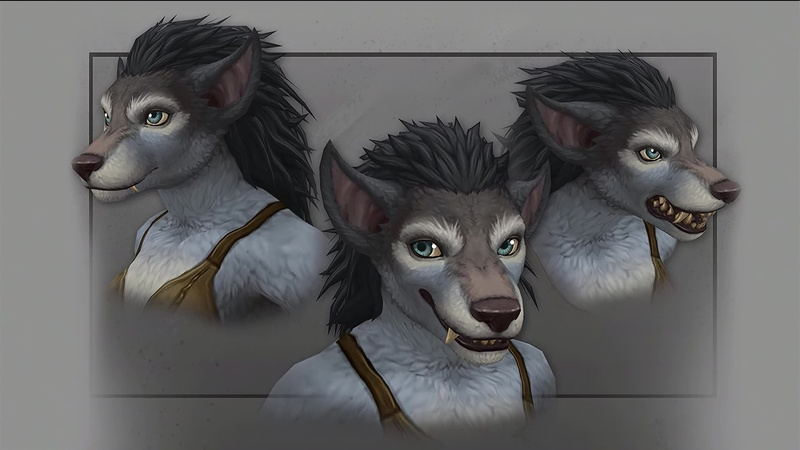 They are capable seafarers, incredible shipwrights and fearless explorers; and they’re going to prove vital in the fight against Sylvanas’ Horde. Oh! That guy looks buff. Here we can see their classes. 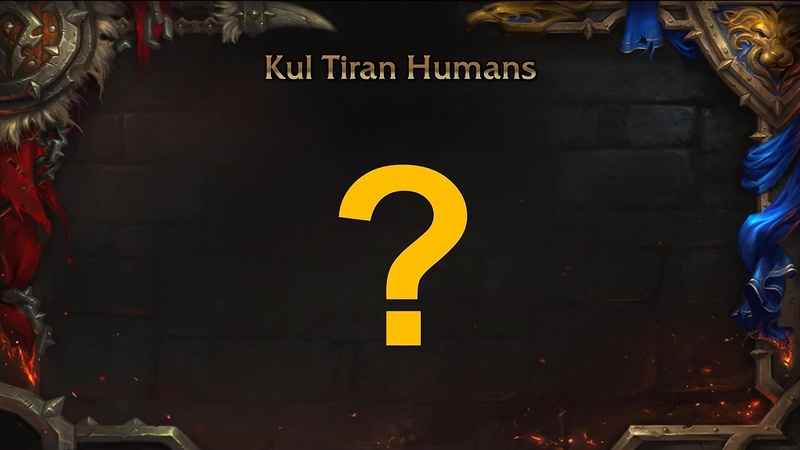 Most notably, Human Druids and Shaman for the Alliance. Their racial abilities reflect their Stout fortitude with Haymaker and Brush it Off. Their artisanal versatility with Jack-of-All-Trades; and their bond with the ocean, with Child of the Sea; and Rime of the Ancient Mariner. Here we see a conspicuous question mark. It’s not a quest. Don’t try to turn it in. 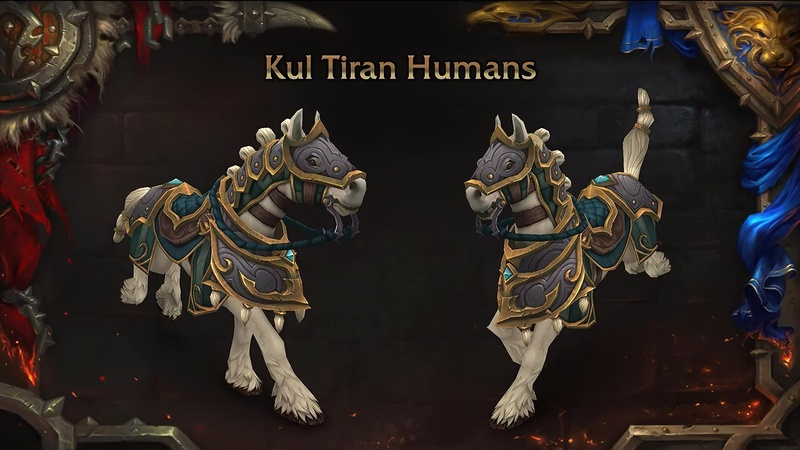 We argued for weeks, even months about what the mount should be for new human race. And finally, someone had an idea that was completely outside of the box; and this is not what you expect… Horses. It’s what you’re expecting. Of course, a horse. Of course. 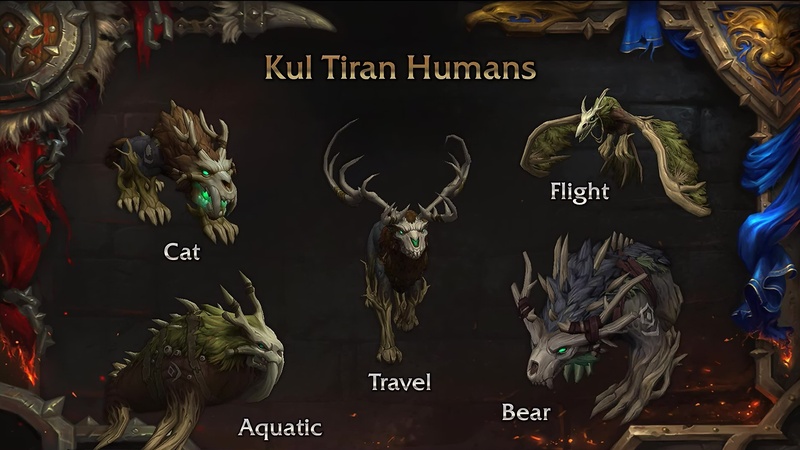 Here we see their druid forms, heavily inspired by the Drust culture. This is their unique— Wait! One of them seems to be missing. We get………… They are always late to the party. I don’t know what I was going to say, so let’s just move on to the Darkmoon Faire. Silas Darkmoon, like every great amusement park tycoon is always on the lookout for new ways to attract new visitors. We realized in the recent audit that something was missing. So ladies and gentlemen, boys and girls, characters of all classes, I give you The (???). Yeah! 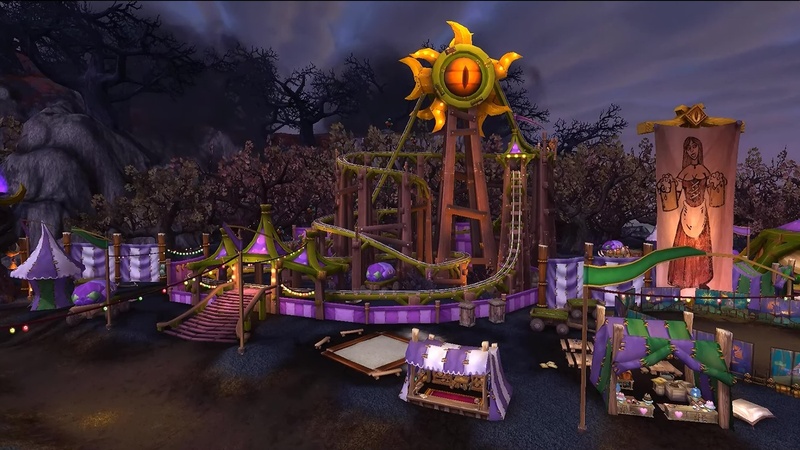 This rollercoaster will be available at the Darkmoon Faire. The next time Darkmoon rolls into town at Patch 8.1.5. Though, the Darkmoon Faire might be the most common holiday in Azeroth; but there’s many more celebrated throughout Azeroth and beyond. And we know some of these are getting long in the tooth, and we’d like to update them over time. And this time at 8.1.5, we’re taking the chance to update one of our favorites;: Children’s Week. 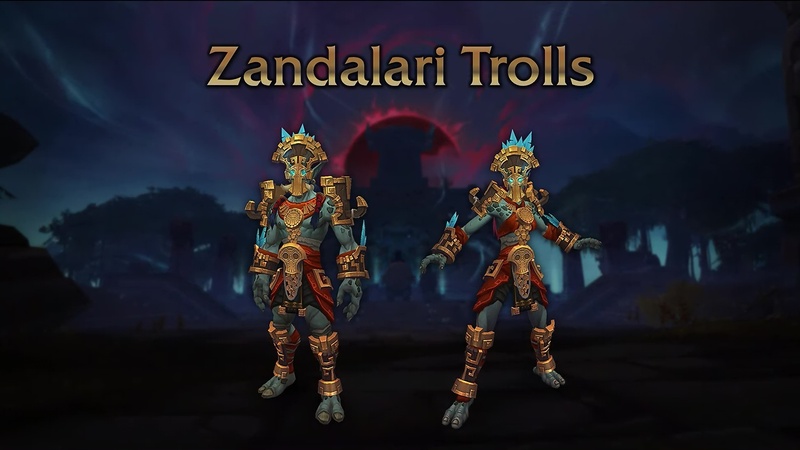 There will be new questlines for the Kul Tiran and Zandalari orphans. They’re adorable, right? 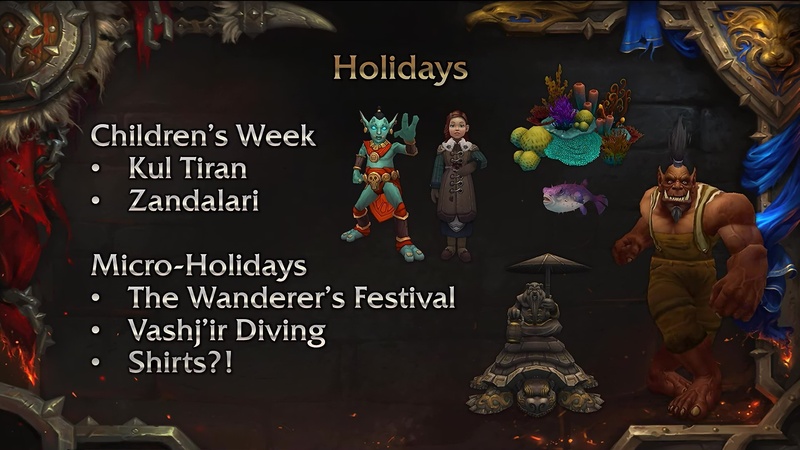 We know a lot of you are enjoying the Micro-Holidays that we introduced in Legion, like Trial of Style, the Kirin Tor Tavern crawl; and we’d like to have more of these as time goes on. At 8.1.5, we’re returning to the Krasarang Wilds to go to the Wanderers’ Festival and celebrate Liu Lang and Shen-zin Su the Great Turtle. We’ll dive under the great reefs of Vash’jir. Your favorites zone to swim in. And who loves T-shirts? Yeah! Pretty much everybody. 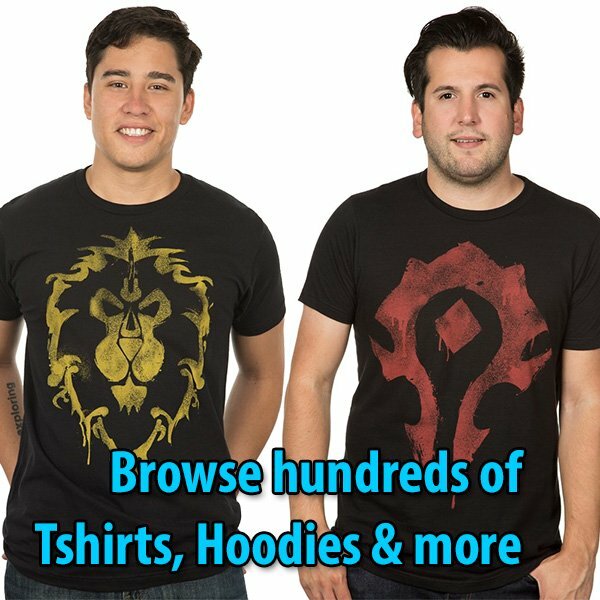 Free T-shirt Day is coming to Azeroth. 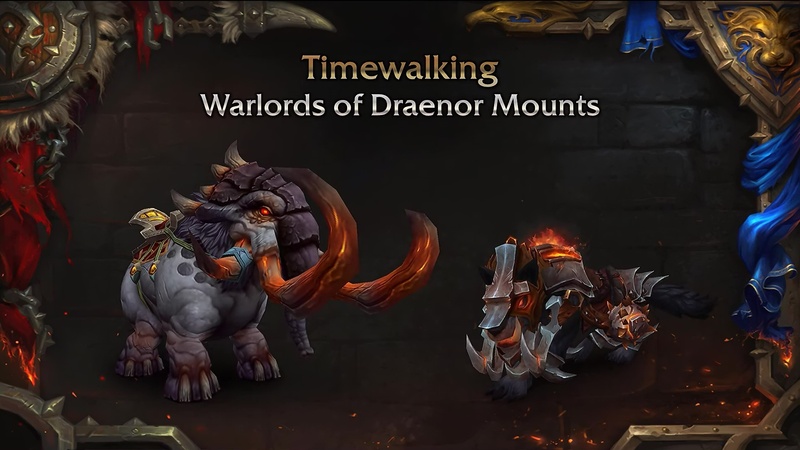 I have no segway to Timewalking. 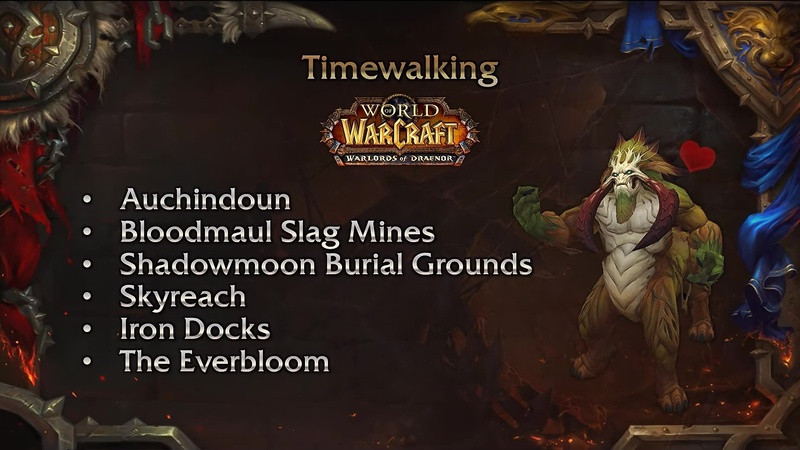 Timewalking was introduced in Warlords of Draenor, so where better to walk back to than Warlords of Draenor itself. 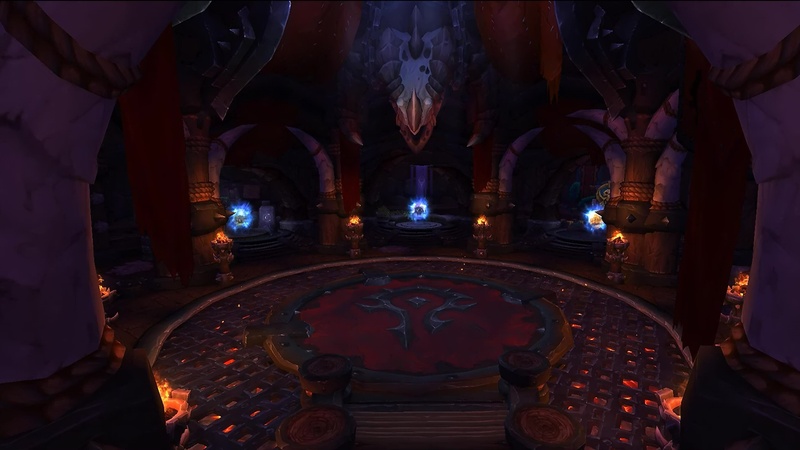 You’ll get to experience some of the favorite dungeons that Draenor has to offer… as well as the Everbloom. And rewards. How about two mounts? Oh, Yeah! Now, we realize that sometimes it’s hard to get around. 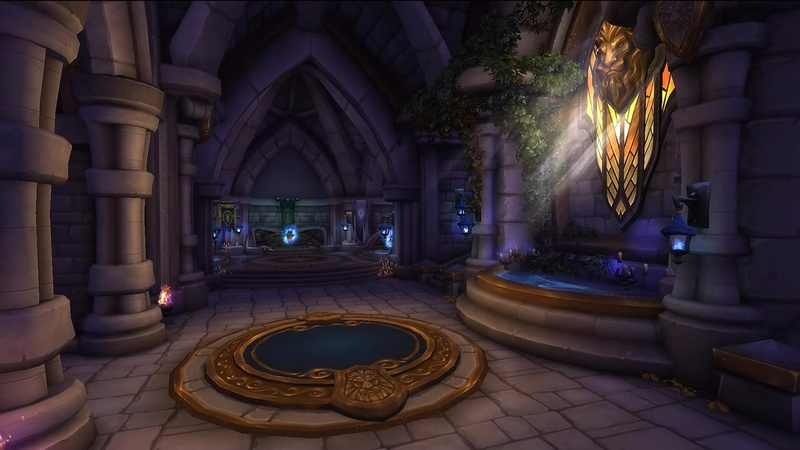 Who can tell me where the Ashran portal is in Stormwind? Wrong. All of you were dead wrong. It’s actually in Stormwind Keep, and we realized that as World of Warcraft continues to grow, it can be hard to find your way around. 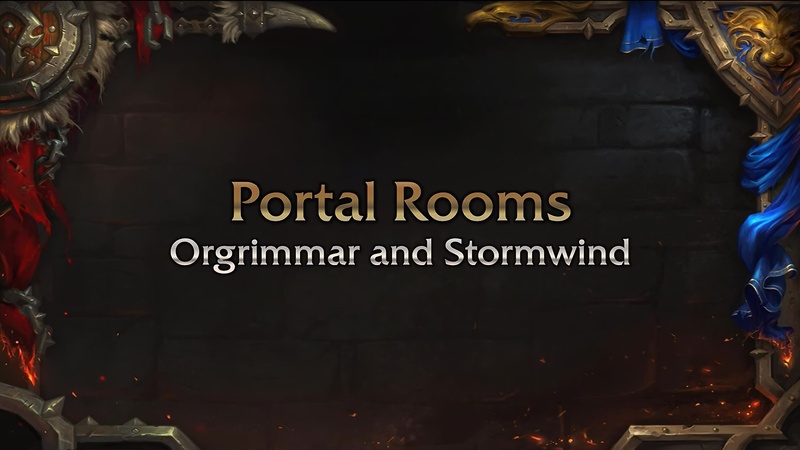 And in our first effort toward improving this travel, we’re introducing Portal Rooms in both Orgrimmar and Stormwind. Now we’re building these in such a way that we can actually add to them. So, rather than finding yet another nook to shove a portal in the Cleft of Shadow, we can actually add to the Portal Room over time. Crafters are you out there? I thought so. I thought so. We know you’ve been clamoring for content in the Battle for Azeroth, and we’re more than happy to oblige. 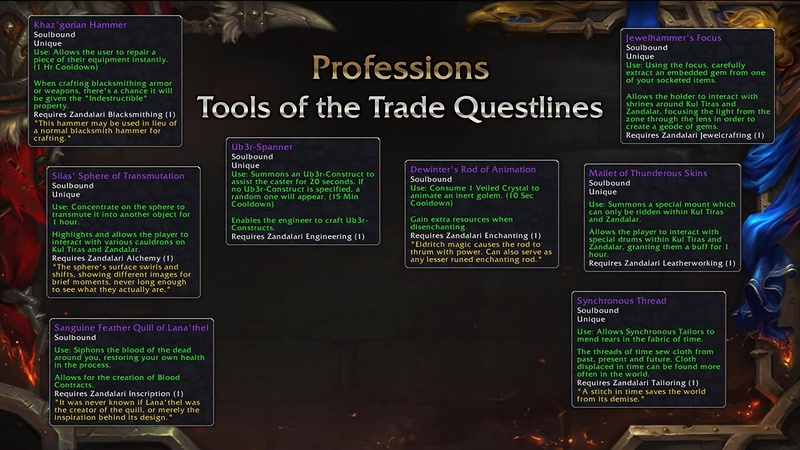 We have new questlines for each and every crafting profession. We call these Tools of the Trade, and the reward: the tools of the trade, that’s pretty evident. Let’s look at a couple— Actually, let’s look at all of them. I’ll mash them all up there for you. Because I know you’re all going to want to see what your class is getting. A couple of examples; Scribes, you’ll get blood contracts. You’ll have a quill that actually when you’re making these blood contracts draws from the corpses of the dead around you and heals your wounds. Blacksmiths, you get to repair your own gear, every once in a while instantaneously; and when you’re making new armor and weapons, you have a chance to make it indestructible. Now I’d go over every single one of these, but it’s been a few seconds, so it’s probably up on the internet already. So you can look at it there. Seems that in every expansion, the Brawlers Guild has to close its doors and retrain its combatants. 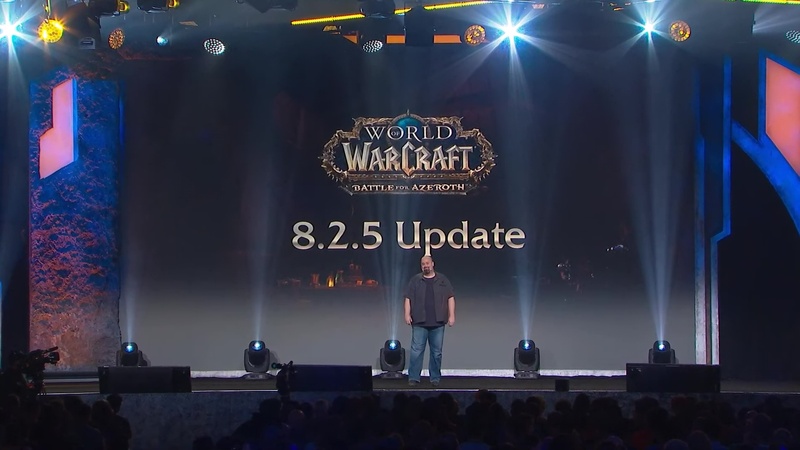 And I’m happy to say in Patch 8.1.5, it’s going to make its triumphant return. 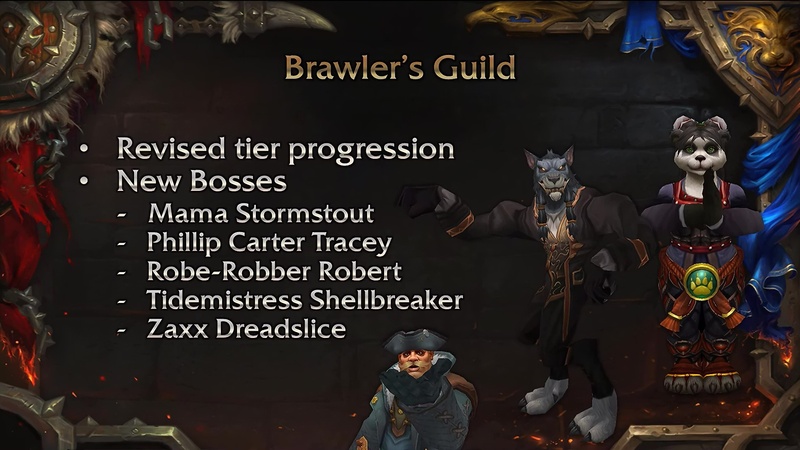 Now, of course, we wanted to address balance and tier progression, add some new bosses like Mama Stormstout, Philip Carter Tracey, and Robe-Robber Robert. But this time we want to do something special. We wanted to introduce a questline that explored the seedy underbelly, of the seedy underbelly that is the Brawlers Guild. 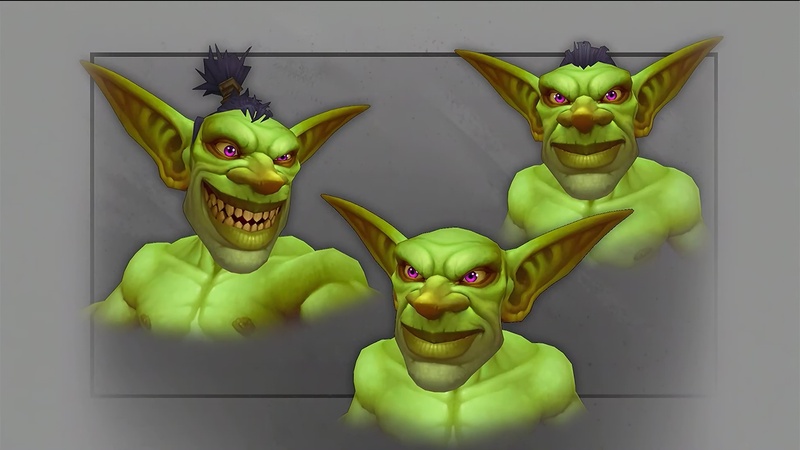 In a World of Warcraft, it begins as all great stories do… with murder. An you, as an esteemed member of the Brawler’s Guild, you will be charged with investigating this murder mystery. And the only way you know how, by punching your way to the truth. And rewards: Shirts. So many shirts. 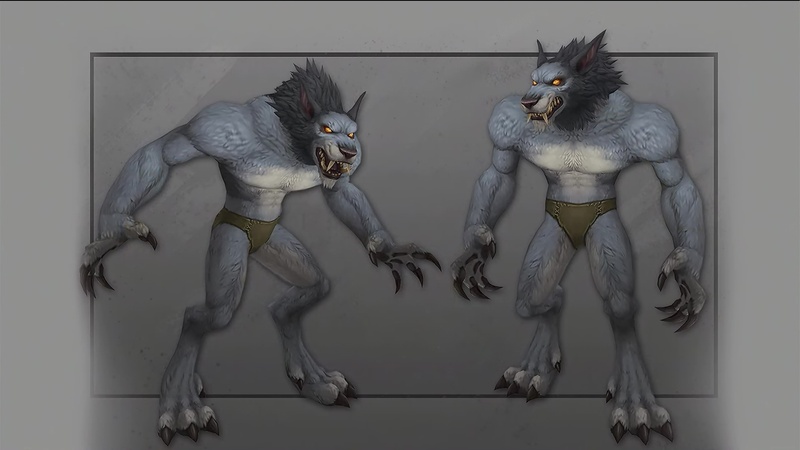 We’re destroying the creation of this with a new Transmog Set. All that said, in the back you wanted to ride everyone’s favorite mount or favorite brawler as a mount? Umm. Yeah! Okay. 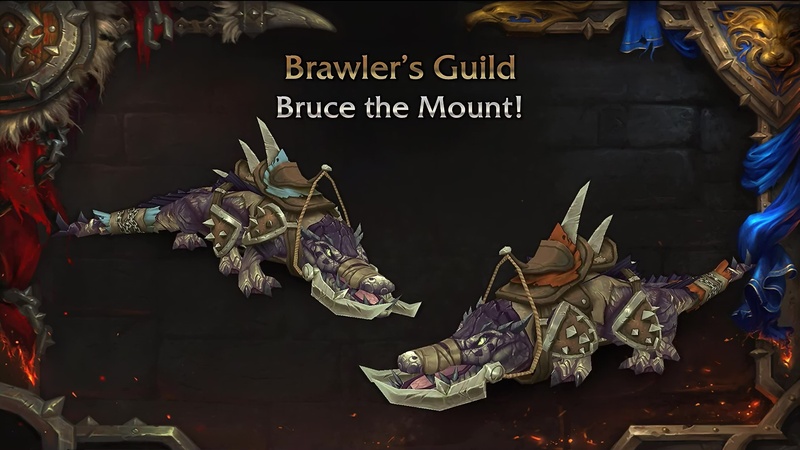 How about Bruce the Mount? And while we’re in the fighting mood, let’s talk about PvP Battlegrounds. 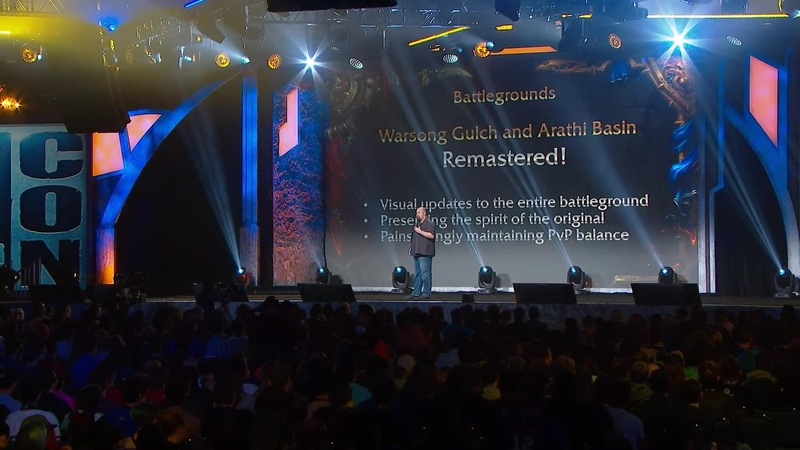 Warsong Gulch and Arathi Basin remastered. Now, of course, we’re doing visual updates to make the entire space beautiful. The sky is not the limit, it will actually even look better. But we’re preserving the spirit of the original as well as painstakingly maintaining the PvP balance down to the very geometry of the terrain. And what will they look like? Well, I’ll explain to you over the next 20 to 30 minutes exactly what they look like… or we can watch a video. Now I will qualify this, these are works in progress and they will look better by the time you get your hands on them. Let’s take a look. Conspiratorial whisper! This next video I want to show you, they said not to show it to you because it’s hideous. It’s in the older Arathi Basin. Who could go back to that after seeing this? I’m going to show it to you anyway. Now, what if I were to tell you that that was a group of players fighting against non-player characters? 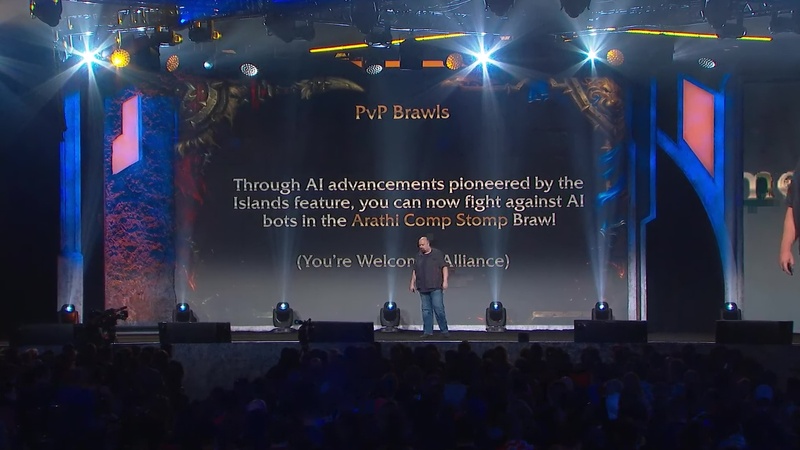 Thanks to AI advancements brought on by the Islands feature, you’ll be able to play against AI bots in the new Arathi Comp Stomp Brawl. 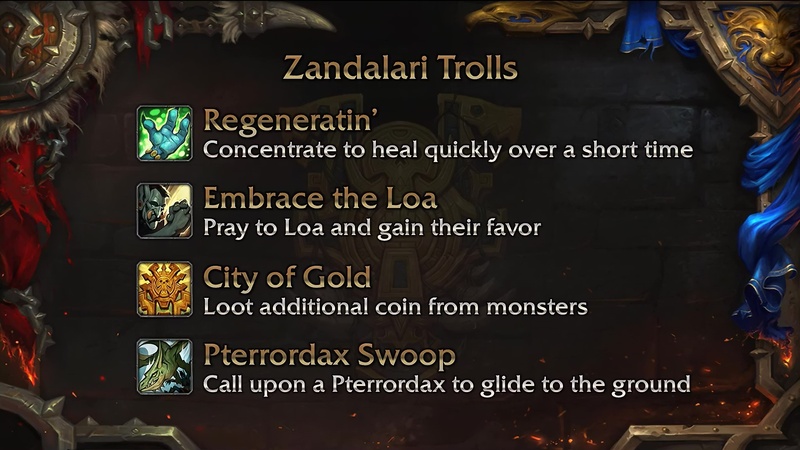 Patch 8.2.5 and beyond. Well it’s going to exist, but I can’t talk about it yet. (Mimics high-pitched annoyed fan): “What’s the matter, why did you make such a pointless slide?” — Very astute of you, fictional front-row fan. I did want to show you just one more thing. 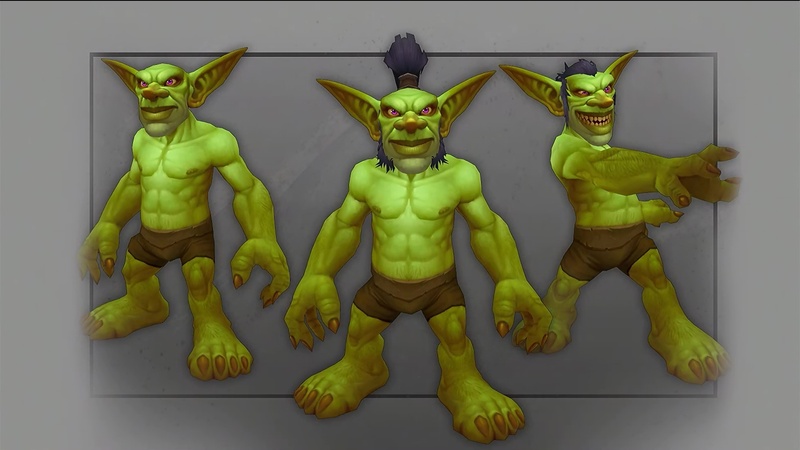 New character models for both the Goblin and Worgen. Alright, thank you guys very much. 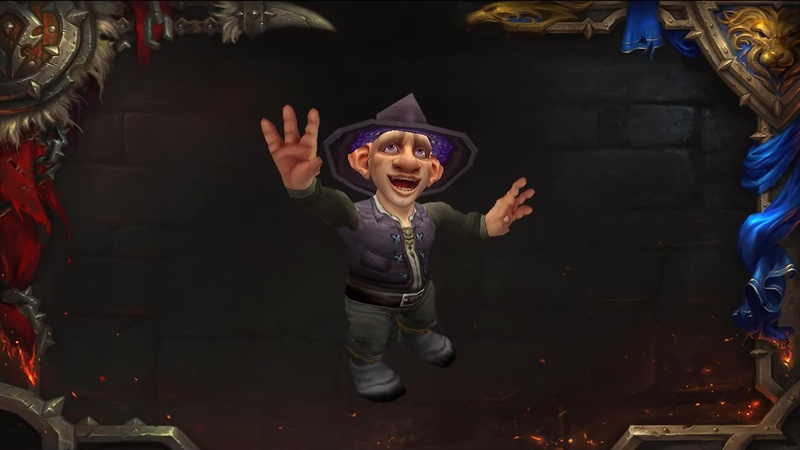 Now, without further ado, please put your hands together for the beard in the Battle Pets himself: Jeremy “Muffinus” Feasle.